Watchmen: Portrait of a Film [Sunday, Feb. 8, 1:30-2:30] features stunning new imagery from the set of the Watchmen movie by photographer Clay Enos. Guiding the audience through some of the most intriguing aspects of capturing the movie in production, Enos will be joined by Watchmen co-creator Dave Gibbons, to discuss his take on the upcoming movie and reveal the history of the pivotal comics work. Presented by Entertainment Weekly star writer and comics guru Steve Daly, and Sarah Rozen, photo editor for a host of America's leading titles including Entertainment Weekly, Women's Health, Newsweek and People, this is a unique opportunity to see some of the extraordinary behind-the-scenes shots that celebrate the making of the much anticipated movie. Watchmen set photographer Clay Enos will also be appearing at Titan's booth from 3-4pm on Sunday, Feb. 8, to sign copies of his stunning new book, Watchmen: Portraits . This large-format hardback presents the cast and crew of the movie in a series of powerful and beautiful black-and-white portrait photographs. 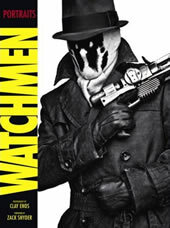 From Rorschach and the Comedian to Knot Top extras, from Zack Snyder to delivery guys and catering staff, this collection presents in a new light those who worked to bring Watchmen to the silver screen. 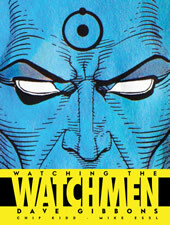 Following Enos, Dave Gibbons will be at Titan's booth from 4-5pm on Sunday, Feb. 8, to sign copies of his stunning art book, Watching the Watchmen , which explores the genesis of the graphic novel through plethora of original character designs, sketches and much more, including posters, covers and rare portfolio art. You can count on me being at the Con as well. If you try hard enough you'll likely spot me at both of these events as well as loitering around the Titan booth from time to time. At this time, the only event Warners has planned for the film is a showing of the “Expanded European Roadshow”movie footage followed by a Q&A with Dave Gibbons on Saturday, Feb. 7, at 11am. But you never know what other Watchmen surprises they may have planned for us unsuspecting fans.